Dementia Care Matters and Helen Sanderson Associates are two industry-changing organisations that work to change the way care and support works. They spotted an opportunity to take their learning and reach a wider audience than ever before by harnessing the power of online learning technologies. Together, they asked HopeWorks to develop branding built on DCM’s established ‘Butterfly Homes’ brand. 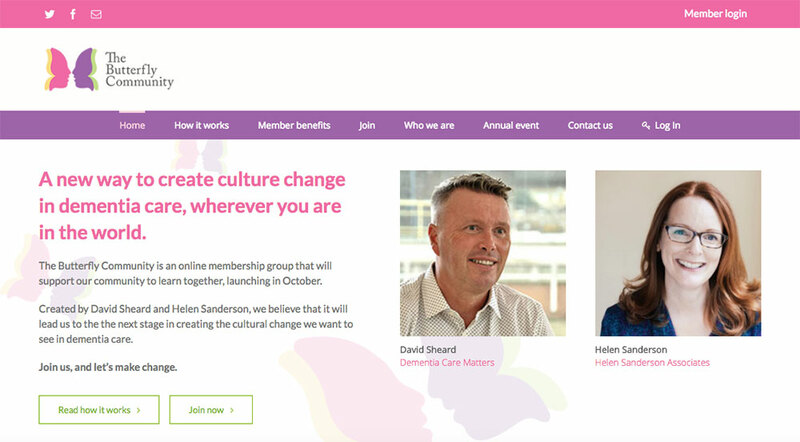 Under this new brand, HopeWorks was commissioned to design and build an online learning hub that would also facilitate community building among dementia care workers worldwide. The Butterfly Community’s branding was based on an evolution of the Dementia Care Matters signature butterfly, but with a feel all its own. By tweaking the primary design, we were able to create something that embodies the idea of people coming together, while maintaining cohesion of the overarching DCM visual brand. 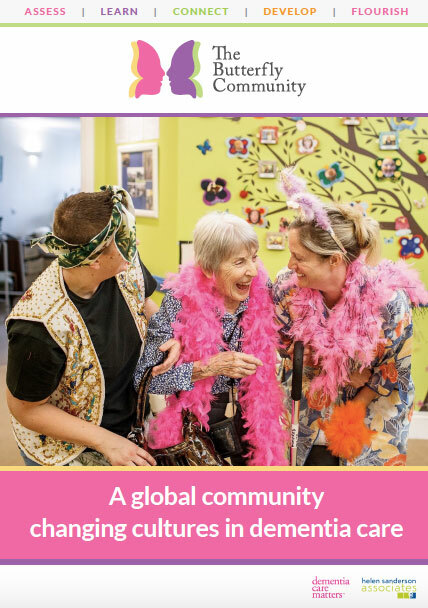 The Butterfly Community’s website is designed to help dementia care workers all over the globe engage with, and learn from, their new online community. Along with the accompanying email campaigns, HopeWorks developed a cohesive and effective way to spread the Butterfly founders’ extensive knowledge in a more efficient way than ever before. In addition to building the site, HopeWorks helped put this amazing new tool into action. We trained the administrators of The Butterfly Community to add new content each month through an easy-to-use content management system so they can take charge of their own message. The built-in automatic member signup means that The Butterfly Community continues to grow through a largely automated process, streamlining behind-the-scenes operations and helping these organisations to have a greater global impact. 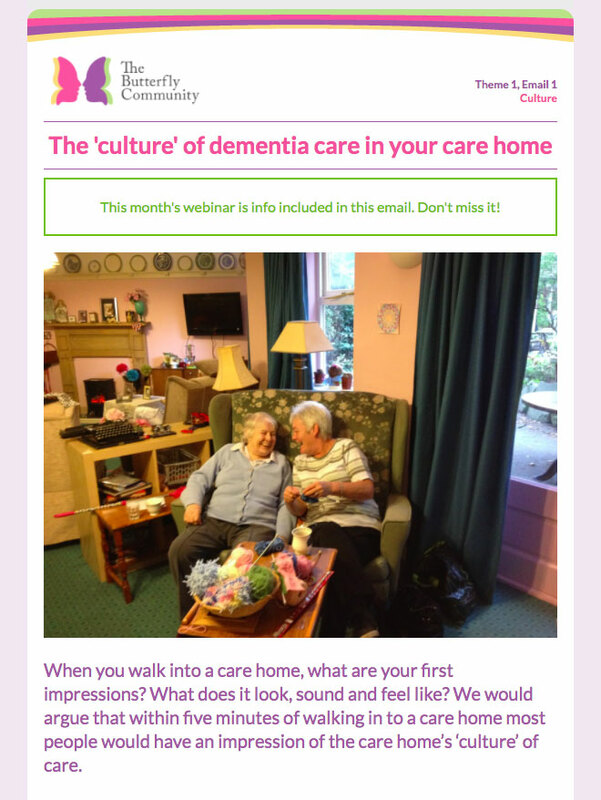 Branded emails are delivered to subscribers each week, sharing information on the current learning theme and directing people to the website for further resources. HopeWorks produced a range of promotional materials to support the site launch, and ran communication campaigns online, on social media, and in print. Over 100 dementia care specialists attended the launch event, and the site has over 100 memberships currently active. Membership costs £495 per year, representing a significant return on investment for The Butterfly Community. The subscription model provides a recurring income stream for the organisation, while also providing a much needed educational service to the care community.